Whenever I fly, I always make sure to wear something comfortable. Planes and airports aren’t exactly the most comfortable places in the world. And traveling can be quite tiring. The least I can do is to start my trip relaxed and stress-free, wardrobe included. Comfortable and practical traveling doesn’t necessarily mean sacrificing style. This is true not only for your wardrobe, but also for your luggage. Meet Delsey‘s top-of-the-line luggage, Karat. 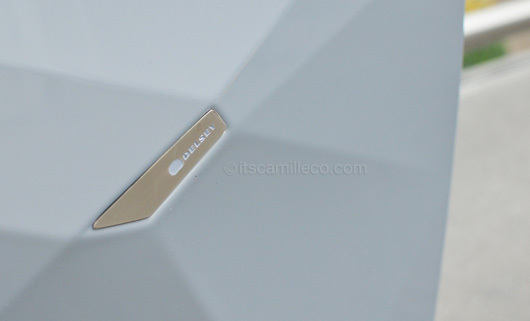 Don’t you just love its sleek design? It’s like a diamond! Delsey‘s Karat has all these and more! It doesn’t just have 4 wheels, it has 8! The double wheels make handling of the luggage easier because they distribute the weight of the luggage more evenly than with just 4 wheels. Most importantly, as with all of Delsey‘s bags, the Karat has Delsey’s patented anti-theft zipper called Zip Securi Tech. Do you know that with just an ordinary ballpen, anyone, and I mean anyone, (trust me, I’ve tried) can open your bag’s zipper without damaging it or you noticing after? The danger here is not only having your items stolen but illegal items stored in your luggage too! (You don’t want to have a starring role on “Locked Up Abroad” now do you?) Unlike other brands, the Zip Securi Tech consists of 2 layers of zipper which makes it studier and thief-proof. 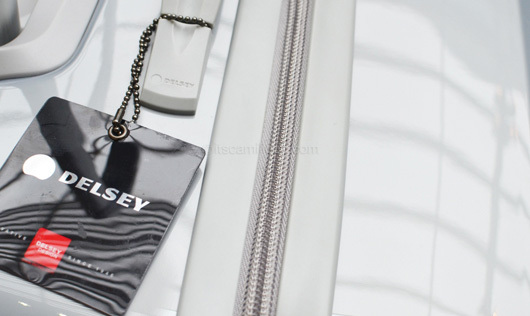 No other brand, no matter how expensive, has this technology, only Delsey. 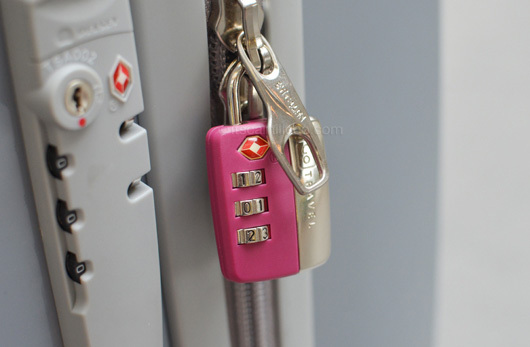 And speaking of security, why don’t you get your luggage a lock from Go Travel too? Go Travel locks are available in a variety of designs, from classic to really quirky ones. Go Travel (formerly Design Go) actually has much more than just luggage locks. It has all the traveling essentials you need! Everything from passport covers, universal chargers, adaptors for 2 earphones in one gadget, compact binoculars, clothes organizers, fans, steam irons, eye masks, ear plugs, portable gadgets…EVERYTHING! I mean look at this! Go Travel has the usual travel accessories like this colorful luggage identity strap. And then, it has a portable straightening iron too! It’s a one-stop shop for all your traveling essentials. 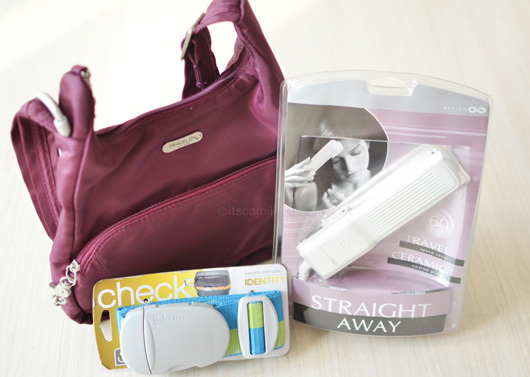 Another brand worth mentioning is Travelon (formerly Travel Caddy). Would you believe that that Travelon bag in the photo above is slash-proof? It has chain link panels all over the bag to make it defensive to cutting and has lockable zippers too. Aside from anti-theft products like this, Travelon also has a Travel Comfort line which comprises of spill and leak-proof bottles, gel seat cushions, self inflating neck and back pillow and the like–perfect for long travels. There you have it! For people like me who love to travel, you can visit these branches to see Delsey, Go Travel and Travelon products. I’m sooo inlove with your outfit here! Soo cute!! especially you, Camille ;) I wish I could wear it too. Thanks Kim! I’m sure you can too! 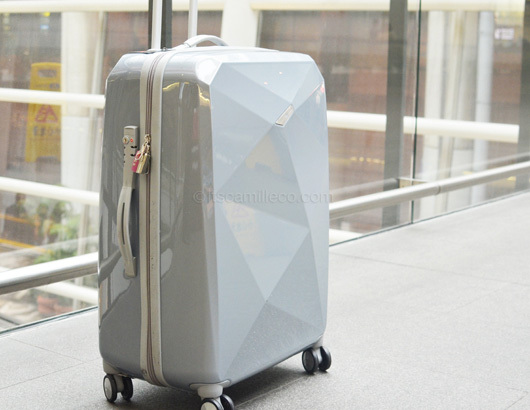 Is the luggage in color white or light blue?